oh! and this is something you can also bottle and keep, or use before you have to collect your pension? oh fabbbbbb! Dan - Where did you find the recipe? I made a bottle of this last year based on one in the River Cottage Preserving Handbook but haven't dared open it yet. At the time it definitely smelled as if it needed some time (7 years?) to mellow! Might be time to take the plunge and crack it open! Gareth - The recipe is partly based on the river cottage one and another recipe for an elderberry reduction. We wanted something we could use straight away, and this worked admirably. Be interested to know what a aged Pontack tastes like. Ah the elderflower tree, the tree that keeps on giving and giving. Nice recipe Dan, I am looking for different uses too but tell me, did it have a slighty 'muddy' taste to it? Food Urchin - Cheers dude. Got to say, it didn't have a muddy taste at all. I'd describe the flavour as sweet, slightly vinegary and with a deep fruitiness. 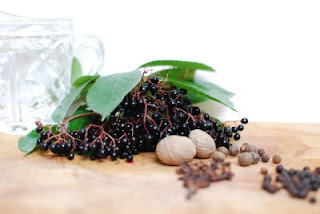 Might give this recipe a try as I have a bucket of elderberries and don't know what to do with them, except maybe crushing them to dye wool with. Mmmmm the elderberry bush in the park opposite my house is calling me...think pigeon might be on the cards this week! Is your source (no pun intended) for this the London Encyclopeadia? Just curious as these odd names fascinate me. Have just made my first batch. There will be more. May - Hahahaha dye wool, that sounds a bit medieval, but will certainly work. Elderberries stain like you wouldn't believe. 'The story goes that there was once a hostelry in London's Lombard Street where Samuel Pepys first drank Chateau Haut Brion. It was on the site of this tavern that Monsieur Pontac - owner of the chateau set up his famous eating house. 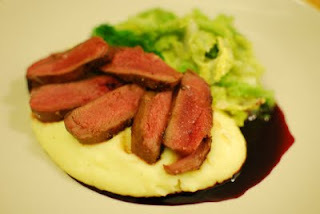 One of his specialities was Pontac's sauce made appropriately from claret and elderberries. In a modified form this became of the the famous of all store sauces'. Interestingly, I found online an e-book 'The signs of Old Lombard Street' which suggests that according to title deeds, the 'Puntack's Head' on the corner of Abchurch lane later became the site of the famous Lloyds coffee house. from whence came the choice clarets. Swift, in his letters to Stella, says that the wine was charged seven shillings a flask, 'are not these pretty rates.' Before Pontack had the house it was known by the sign of the "White Bear." So, in conclusion I could find only one source attributing Monsieur Pontack as being the originator of Pontack Sauce, but there's seemingly a total absence of any competing claims, and it makes a good story don’t you think? Really enjoyed this recipe, thank you. Will be gathering more and making the other version for posterity next weekend! Instead of red wine vinegar try balsamic and a large helping of port. Excellent with mint to slow cook lamb!! I found a similar pontack recipe in one of the wartime Penguin books - made some about 25 years ago - OK, but wasn't that impressed:- kept the bottles. About to throw them some years later - gave it a try and was very impressed. Looked it up further (can't remember source (sauce?) but pre-Google) - remember reading that it was so popular in Georgian times that members of Gentlemen's London Clubs used to have their own secret recipes and bring their own bottle to dine. The seven year bit was definitely originally not 'up to 7 years' but 'at least 7 years' - I agree, vintage is best, and a thickened sauce/ketchup is good. Great with strong meats, sausage and mash etc. Also great with rice dishes - but will turn everything purple.